Sprinkling irrigation is the method of applying water to the soil surface in the form of a spray which is somewhat similar to rain. 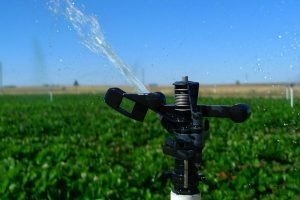 In Sprinkling irrigation method, water is sprayed into the air and allowed to fall on the soil surface in a uniform pattern at a rate less than the infiltration rate of the soil. Sprinkling irrigation method started in the beginning of this century and was initially limited to nurseries and orchards. In the beginning, it was used in humid regions as a supplemental method of irrigation. Sprinkling irrigation method is popular in the developed countries and is gaining popularity in the developing countries too. Rotating sprinkler-head systems are commonly used for sprinkler irrigation. Each rotating sprinkler head applies water to a given area, size of which is governed by the nozzle size and the water pressure. Alternatively, perforated pipe can be used to deliver water through very small holes which are drilled at close intervals along a segment of the circumference of a pipe. The trajectories of these jets provide fairly uniform application of water over a strip of cropland along both sides of the pipe. With the availability of flexible PVC pipes, the sprinkler systems can be made portable too. (iv) Lands with shallow soils and undulating lands which prevent proper levelling required for surface methods of irrigation. can be applied easily and frequently by the sprinkler system. Light and frequent irrigations are very useful during the germination of new plants, for shallow-rooted crops and to control soil temperature. Measurement of quantity of water is easier. It causes less interference in cultivation and other farming operations. While sprinkler irrigation reduces percolation losses, it increases evaporation losses. The frequency and intensity of the wind will affect the efficiency of any sprinkler system. Sprinkler application efficiencies should always be more than 75 per cent so that the system is economically viable. The sprinkler method is replacing the surface/gravity irrigation methods in all developed countries due to its higher water application/use efficiency, less labour requirements, adaptability to hilly terrain, and ability to apply fertilizers in solution. In India too, the gross area under sprinkler irrigation has increased from 3 lakh hectares in 1985 to 5.80 lakh hectares in 1989. The total number of sprinkler sets in India now exceeds one lakh.